Four Bram Stoker Award™ winning poets join together to paint a rich, dark tapestry of evocative emotion in The Four Elements. From modern interpretations to ancient mythology, they explore the magic and mystery of Fire, Water, Earth, and Air. Their vivid poetry and prose brings to life a universe in a grain of sand, taking the reader through a journey of discovery from the inside out. Hear the hot voice of invisible awareness in Linda Addison's interpretation of Air. Explore the realm of ethereal and surreal liquidity in Rain Graves' Water. Burn from crevice to crown in Charlee Jacob's wild-eyed visions of Fire. Contemplate Marge Simon's poignant twists of dark irony to eruptions of spontaneous wonder in Earth. 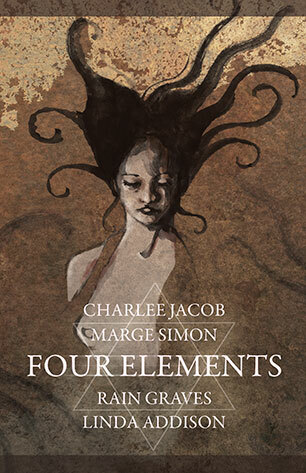 There is something for everyone in The Four Elements--conjured especially for the reader that likes to examine the meticulous depth and meaning in every word.